It's sometimes easy to take for granted (or completely forget) what an impact technology has made on all our lives, whether that's having access to 30 million songs on the go or being able to get real banknotes out of a hole in the wall at any time of the day or night. 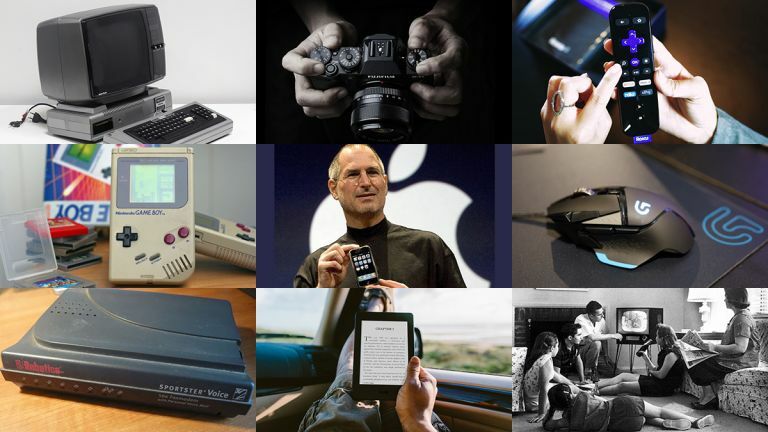 Well, we're here to pay tribute and recognise 11 of these life-changing gadgets from the last century or so - some of them you might never have owned yourself, but you'll have certainly benefitted from their ongoing influence on the tech that followed afterwards. We can't really call the internet a gadget so let's go for the modem instead, and its sort-of-successor the router - remember the days when you couldn't go online and use your landline at the same time? Software-controlled modems arrived in the 1980s alongside the first personal computers, and consumer-level Wi-Fi routers were slowly introduced from the start of the 21st century. We could've just said "the smartphone" here but it's really the arrival of the iPhone in 2007 that changed the direction mobiles took: Steve Jobs and his Apple engineers saw the device as a miniature touchscreen computer first and a telephone second, and it was soon an approach everyone else was taking too. Today's models aren't all that different from the blueprint that Jobs set down. The first digital cameras of the late 1980s were slow and expensive and produced images of a very poor quality, but they changed the way pictures were recorded forever: they added the ability to view snaps instantly, to take thousands of pictures in one session rather than a couple of dozen, and eventually to share images in a matter of seconds with the wider world. The Game Boy revolutionised handheld gaming and entertainment in general: it was one of the first gadgets to be portable, affordable and actually fun to use, which is perhaps why Nintendo has sold around 118 million of the things down the years. Smartphones may have taken over when it comes to portable gaming, but the Game Boy blazed the original trail. Seeing something happen in real-time on the other side of the world is old hat today - but it was life-changing in the 1930s, when the first televisions started to go on sale to the public. From breaking news and educational content to Game of Thrones and on-demand video, the television really has caused a seismic shift in the way human beings communicate and get their information. The MP3 codec was instrumental in getting music down into a format that was both small in terms of its file size and respectable in terms of its audio quality. When the first MP3 players subsequently arrived, the number of music tracks anyone could take on the move with them quickly went from a dozen to several thousand. The remote control might seem like a relatively insignificant gadget but consider how many parts of your everyday life - from car locks to lights - you control wirelessly. Nikola Tesla lays claim to the first remote control that worked via radio waves, developed in 1898 and called the teleautomaton, though with the arrival of wearables and smartphones these standalone devices are now on the way out. The fact that the humble computer mouse hasn't changed much since the 1960s is a testament to what an important and game-changing gadget it originally was. It helped to enable the shift from command prompt operating systems to the point-and-click graphical user interfaces we know today, and it still beats all other forms of input when it comes to actually getting stuff done. Computers weren't originally intended to be personal, costing huge amounts of money and taking up entire rooms in the early days. Rudimentary PCs first appeared in the 1950s, but three machines launched in the year 1977 - the Commodore PET, the Apple II and the Tandy TRS-80 - really sparked the microcomputer revolution, setting the foundations for the laptops and the desktops of today. Not strictly speaking a 'gadget', but a piece of machinery that's become a crucial part of modern life (until mobile payments become ubiquitous anyway). Before the arrival of the first Automated Teller Machine in 1967, we were all getting our cash over the counter in the bank - and if you didn't have enough on Friday night to last you until the following Monday, then it was hard luck. Just like the Apple iPod wasn't the first digital music player, the Amazon Kindle wasn't the first ereader - but it played a significant role in getting the device into the hands of a significant number of people. Backed up by Amazon's vast retail ecosystem of digital and physical books, the Kindle has been at the centre of our changing reading habits in an always-on, always-connected world.